Jackpot City Casino is one of the industry pioneers that have been around since 1997, providing exceptional gaming experience. They still continue to do so until this day and are a top choice for many players across the world. 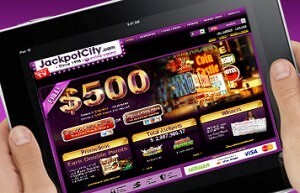 Even though Jackpot City primarily targets players from the UK, their brand has become well received and recognized worldwide. Choose from more than 400 games and take advantage of their welcome offers, that’s what this casino is all about. A large portion of the success this casino has been enjoying could be because of their software and variety of games offered. You’ll find more than 400 titles including some of the top slots as well as huge variety of table games, such as blackjack, roulette and more. All the games are powered by MicroGaming, industry leading gambling software developer. Instant Play Version – suitable for users of Mac and Linux powered devices. Enjoy more than 250 games, playable directly from your browser. Downloadable deluxe casino client – over 450 games offered with the best gaming experience possible. Enjoy advanced features in all games you play. Unfortunately this version is only available for users of Windows powered devices. If you’re looking to gamble on your mobile or tablet, the casino also offers a handful of mobile casino games, including the Mega Moolah Jackpot Slot, which features one of the largest progressive jackpots out there. As mentioned in the introduction, you’ll find more than 400 games offered, all of whom are created by MicroGaming. Let’s take a look at the most popular slots and variations of table games offered. You’ll have the widest variety of slot machine games to choose from. This includes fruit machines, jackpot slots and some truly staggering video slot machines. Mega Moolah – the most known progressive slot on JackpotCity. Take a shot at winning one of the four progressive jackpots with the largest being written in 7 figures. Immortal Romance – a recently launched slot game that has been created after the popular movie ”Twilight”. It’s a part of the new, revolutionary series of MicroGaming’s slot machines, offering 243 ways to win. The Dark Knight – probably the loudest slot release in the year of 2012. Slot game themed after Batman, offering 243 ways to win and a huge progressive jackpot, currently exceeding £5 million. Available for play at JackpotCity Casino. HitMan – a 15 pay-line video slot machine visualizing the popular Agent47 character. It’s created after the popular console game with the same title and offers effective animations and rewarding payouts. King Cashalot – another progressive slot by MicroGaming. This 9 pay-line video slot machine with several bonus features as well as the wild symbol, visualized as King Cashalot himself. If you’re a lover of blackjack, roulette or just about any other table game, JackpotCity will blow your head off. There are more than 40 blackjack variations as well as a dozen of roulette ones offered. While the main rules remain the same, each game type offers some small changes in rules and payouts. BlackJack – Vegas, Single Deck, Multi Hand, Atlantic City and more types available. Roulette – American, European, French, Progressive, MultiWheel and more types available. Other Games – Craps,Video Poker in a dozen variations, Sic Bo, Baccarat, Caribbean Poker, Casino War and much more is on the offer. 1st deposit bonus – claim a 100% bonus up to $/£200 on your first deposit by simply opening an account and making a deposit. 2nd deposit bonus – claim a 100% bonus up to £/$300 on your second deposit by simply making one. 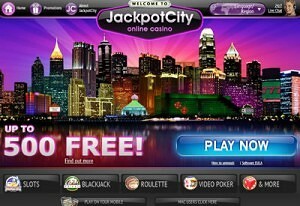 That’s $/£ in total completely free, just because you’ve chosen to play at JackpotCity. Welcome bonuses are a subject for wagering requirements. You’ll have to wager 50 times the bonus amount before a withdrawal request can be made. Meaning if you claim the full amount of £/$500, total wagers of $/£25,000 will be required. In case you run into any issues or just have questions, JackpotCity offers a 24/7 customer service in several languages. Sorting any problems will only take a couple of minutes. Alternatively, you can also browse the FAQ section, which will come in handy, if you’re issue is of basic nature. Overall, Jackpot City Casino is an A+ in our book, when it comes to customer care.